Named for the white ring around the neck of the male. Their favorite habitat includes prairies, croplands, and now, your yard! Plan includes FULL SIZE patterns for male and female. 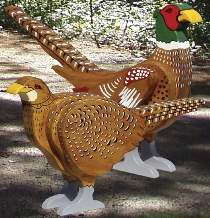 Male measures approximately 22"L. Order 2 amber eyes for each bird separately below.